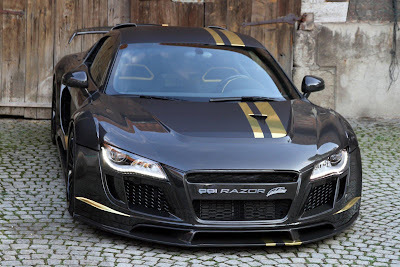 PPI's ultra-low production, Audi R8 V10-based, RAZOR GTR-10 is hardly 'news' to us, we reported the car's debut at the Top Marques of Monaco show in April, and even caught a glimpse of this rare beast on the street. 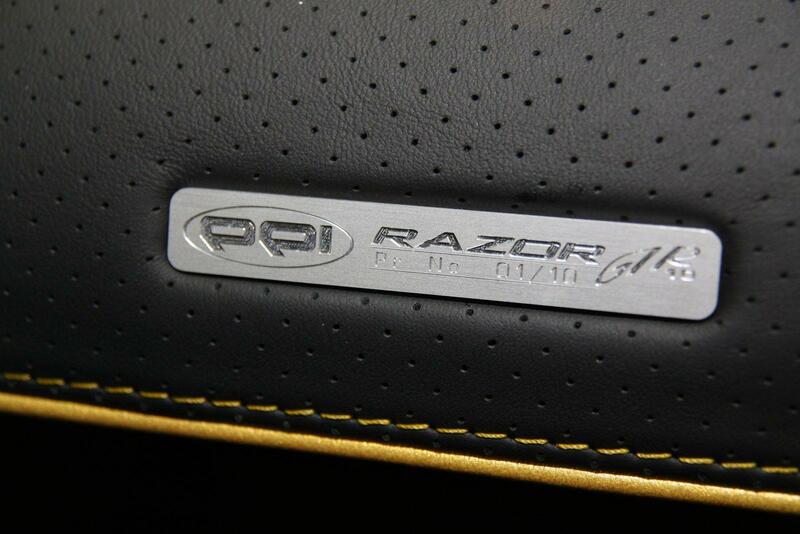 However, PPI has now officially revealed the RAZOR GTR-10 and provided a few more details than we had back in April. The PPI RAZOR GTR-10's creed is simple; more power, more style, more passion. In the power department, a ram-charged sport air filter system, high performance stainless steel exhaust and remapped ignition increases the 5.2-liter V10's output to a very impressive 601 horsepower and 417 lb/ft of torque. Which, PPI says, should rocket the RAZOR GTR-10 from 0-100 km/h (62 mph) in 3.2 seconds on to a top speed of 335 km/h (208.16 mph). Outside, the PPI RAZOR GTR-10's aggressive looks are more a byproduct of extensive wind-tunnel testing and weight reduction rather than just a cosmetic upgrade. 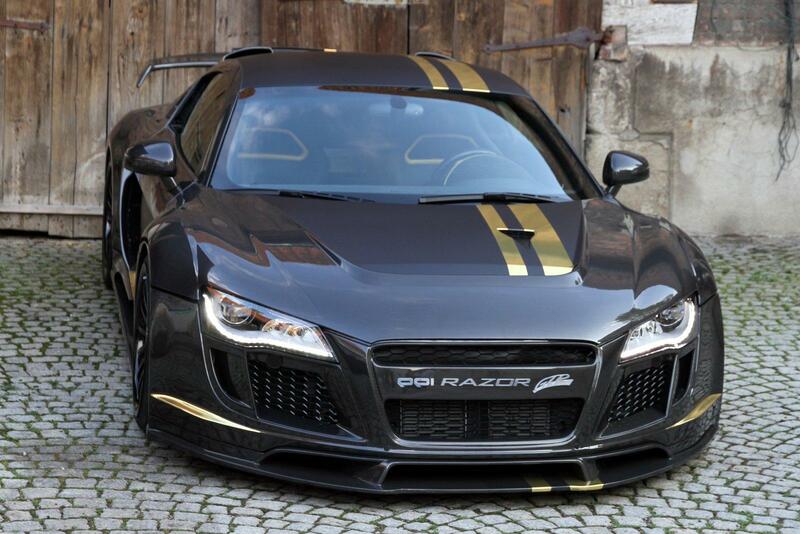 The entire skin is optical carbon fiber and features upgrades from nose to tail. Most notable is a specially engineered front bumper and diffuser (designed to reduce lift and offer extensive radiator and brake cooling) and a special hollow carbon fiber rear wing with an adjustable Gurney-flap (that PPI says perfectly balances the down-force behavior of the front and rear axles). Rounding out the package is a specially developed 6-piston high-performance braking system (with extra large 380mm x 36mm front and 356mm x 32 mm rear discs), KW Automotive suspension system (featuring a front hydraulic front lifting system combined with PPI's springs, camber kit and tie-rod kit) and specially designed lightweight MAG11 forged aluminum PPI wheels (9x19" front 12x20" rear) wrapped in Michelin Pilot Sport 2 rubber. As the "10" in the GTR-10 name implies, production of the PPI RAZOR GTR-10 will be limited to just ten units at a price of €360.000 each. The only exclusive Audi-tuner from Germany, PPI Automotive Design GmbH, breaks through the Audi-tuning arena yet again, and presents their new limited production Supercar, the PPI RAZOR GTR-10. The Audi specialist turned its focus on optimising the power-to-weight ratio of the Audi R8 while simultaneously strengthening the motor, increasing performance, improving handling dynamics, and managing to reduce the weight of the Audi R8. The end result is a culmination of knowledge from the past year in research and development to create a truly inspired production car; the RAZOR GTR-10. This vehicle will be available to only 10 select individuals. 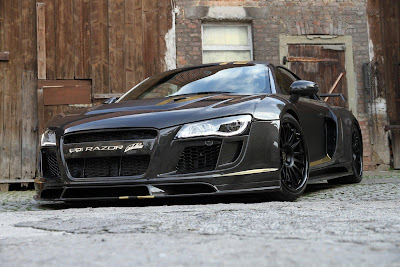 Following the introduction of the PPI RAZOR GTR supercharged V8; PPI Automotive Design GmbH has increased their repertoire by refining the Audi R8 V10 model. 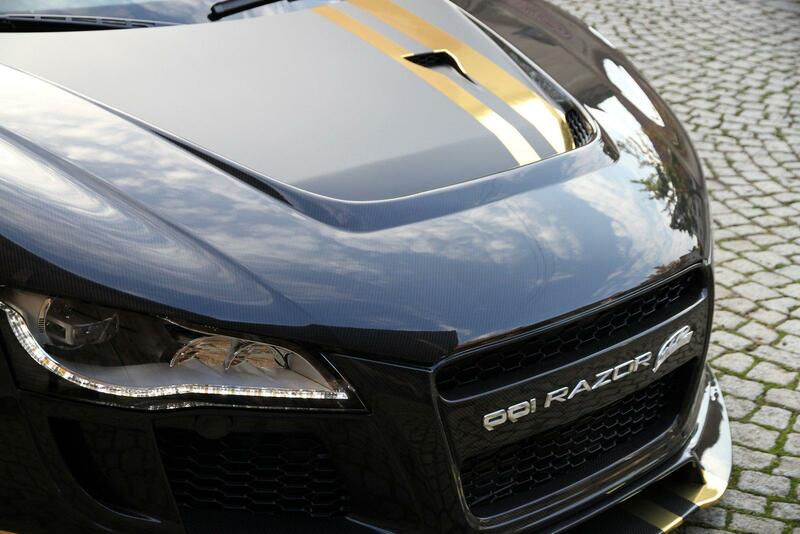 PPI Automotive Design utilized all its magic to optimize the aerodynamics as well as performance of the series vehicle. The essential part of the motor alteration is the incorporation of race-proven parts. The air intake system over the rear engine cover is not only a lightweight component but also serves dual duty as a channel for the ram-charged sport air filter system. 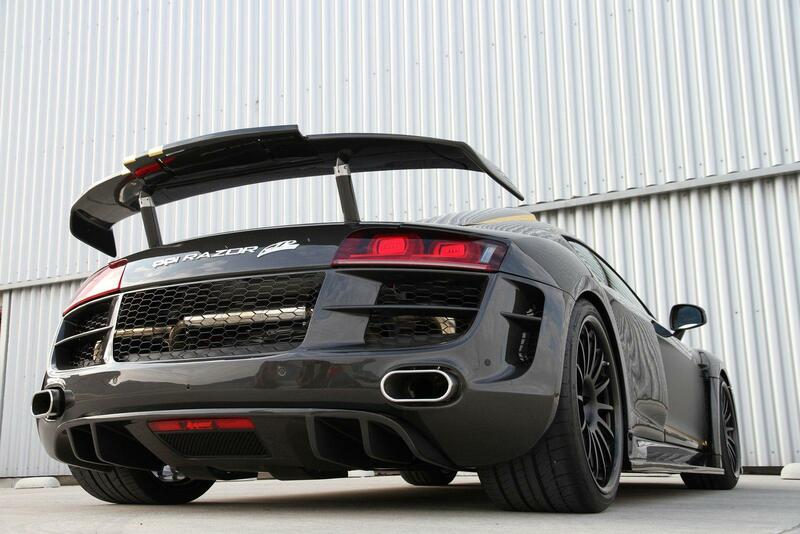 A lightweight high performance exhaust system made of stainless steel has been designed and added specifically to work in conjunction with the V10. This is tipped off with Ceramic-Coated oval tips. These components are precisely adjusted to each other with the help of a new ignition map for motor electronics. The result is pure engine refinement of the highest calibre. 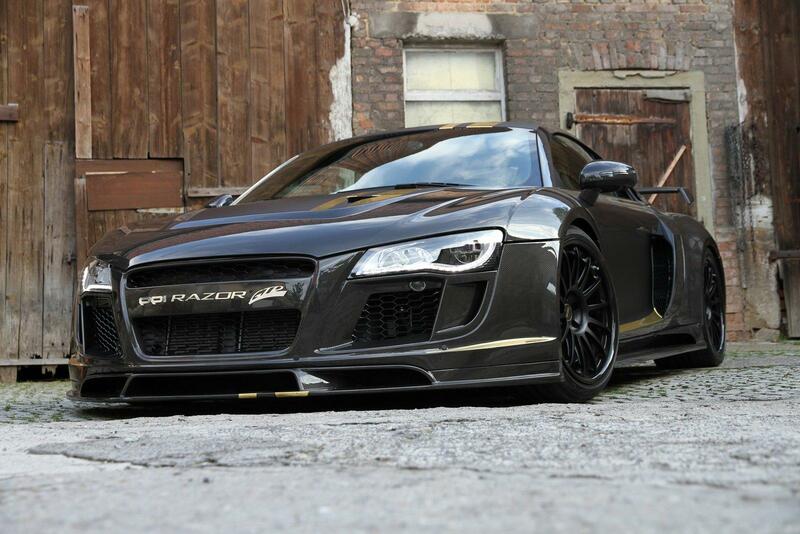 The result, after this extensive modification, is a normally aspirated V10 engine with over 601 hp (448 kW). 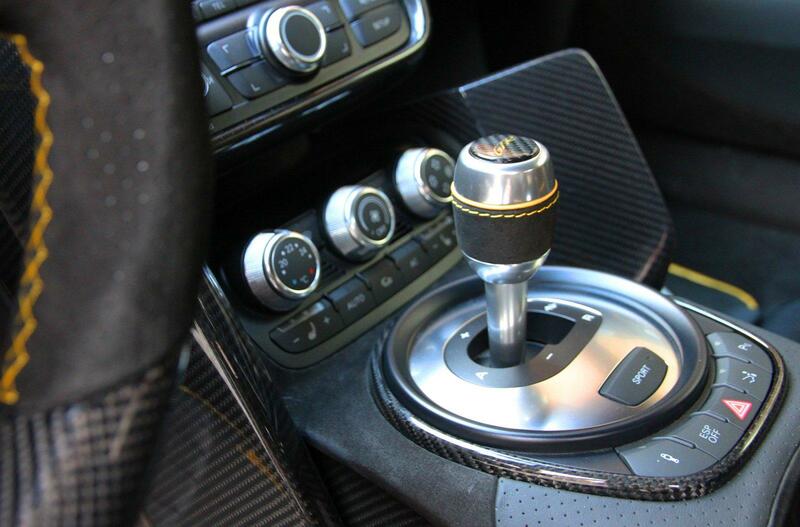 at 7,400 rpm, and a maximum torque of 565 Nm at 6,400 rpm at its disposal. Couple the power increase with a weight decrease of 250 kg (depending on options) over its serial counterpart (serial curb weight V10 R-tronic: 1,625 kg). The end result is the ability to achieve speeds from 0 to 100 km/h in a mere 3.2 seconds (with modified R-tronic Gearbox) and a maximum top speed of 335 km/h. 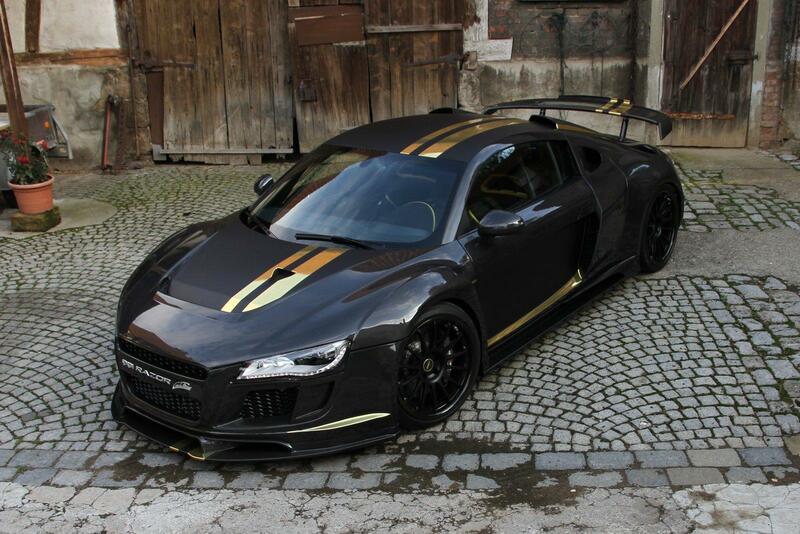 This insures the proper performance to easily meet the demands of its motorsports and enthusiast clientele. 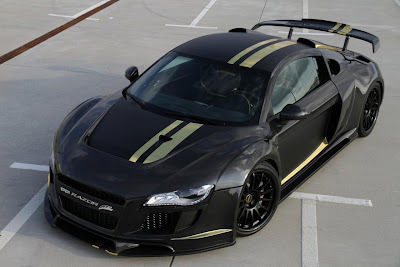 In addition to the excellent driving performance, this PPI Supercar also has a striking widebody appearance with elaborate, wind tunnel tested aerodynamics. Special attention was paid to the reduction of the vehicle's weight, which was achieved by PPI's extensive use of the high-strength formula 1 and aerospace-proven Carbon Fibre technology. All parts are made of this high-tech material, reducing weight and adding strength in the process. The RAZOR GTR-10 front bumper replaces the serial bumper and the new design in conjunction with a specially engineered front diffuser reduces lifting forces at the front axle. Larger air inlets in connection with a new incorporated LED day-running unit present the two-seater with an even more athletic and aggressive face. More importantly, these air inlets feed the radiators with additional fresh air and channels through the new front hood to provide optimal cooling to the brake system. PPI sideskirts highlight the sporty profile of the RAZOR GTR-10 and also diffuses the airflow around the sides of the car for improved aerodynamic stability. The inlets of the sideskirts further aid much needed cooling to the engine oil coolers and rear brake system. 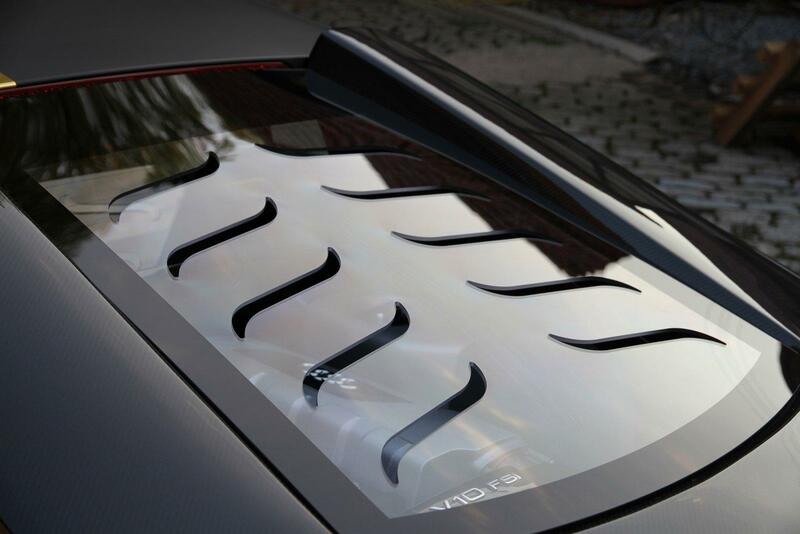 The roof pillars and doors, like the rest of the supercar, are draped in carbon fibre. In order to perfectly balance out the down-force behaviour of the front-axle with the rear axle, PPI equips the RAZOR GTR-10 with a special hollow, Carbon Fibre rear wing with an adjustable Gurney-flap. The motor cover is made of carbon fibre and incorporates glass made of the light high-tech polycarbonate material Makrolon®. The engine lid also has specially designed Carbon Fibre ram-charged air inlets that replace the heavy OE/OEM Engine cover and further aids in cooling the engine as well as feeding ram-charged air to the intake system, ensuring the consistent performance of the RAZOR GTR-10. 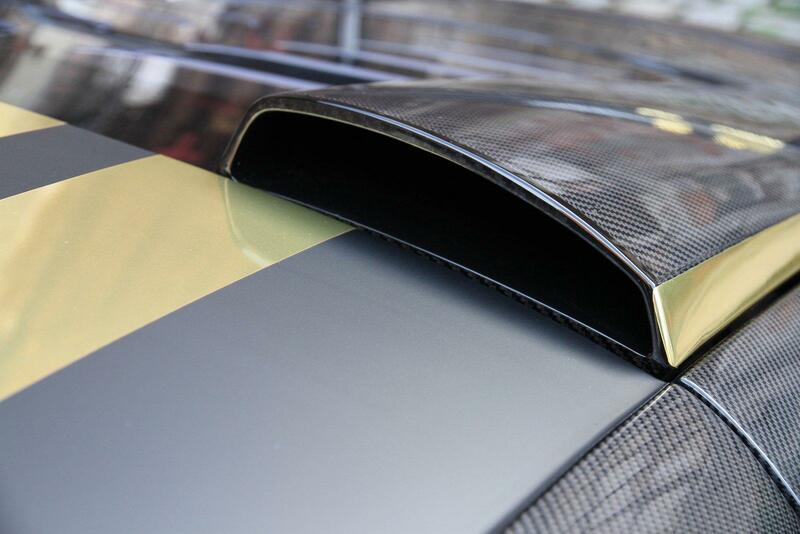 Aiding in the engine cooling, are the newly designed side blades, rear fenders and rear bumper that all allow for additional motor bay and exhaust cooling that, in conjunction with the Carbon Fibre rear diffuser, optimises the airflow over and through the rear portion of this sharp performance car. A new widebody skin allows the PPI RAZOR GTR-10 the proper structure to accommodate all the performance enhancements, including wider wheels and tires. Not to mention enhancement to the overall appearance of the car. 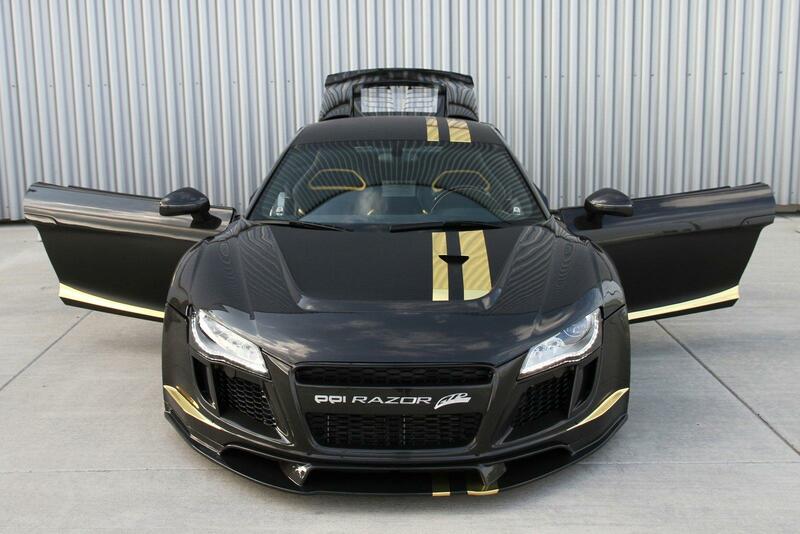 The RAZOR GTR-10 utilizes specially designed lightweight MAG11 Forged Aluminium PPI wheels. At the front, 9Jx19 MAG11 wheels weighing 10.0 kg with 245/35 ZR 19 Michelin Pilot Sport 2 tyres are fitted and an impressive 12.0J x 20 MAG11 wheels weighing 10.9 kg with 325/25 ZR 20 Michelin Pilot Sport 2 tyres are used at the rear. This wheel and tyre-combination proves to be the optimal balance between comfort and control while maintaining proper road feedback for the driver. PPI has also developed a special high-performance braking system available for the RAZOR GTR-10 that can be identified by its metallic orange-coloured brake callipers. The optimal deceleration and perfect pedal pressure control is now achieved by enlarged 6-piston callipers in connection with extra-large discs measuring 380 x 36 millimetres at the front and 356 x 32 mm discs at the rear axle providing greater pad surface contact area and heat dissipation. Alternatively, the vehicle can be equipped with Audi's Carbon Ceramic Brake System with PPI-specified higher friction brake pads. Nothing has been left untouched, as is evidenced by the new coil over kit developed in conjunction with technology partner KW Automotive GmbH. 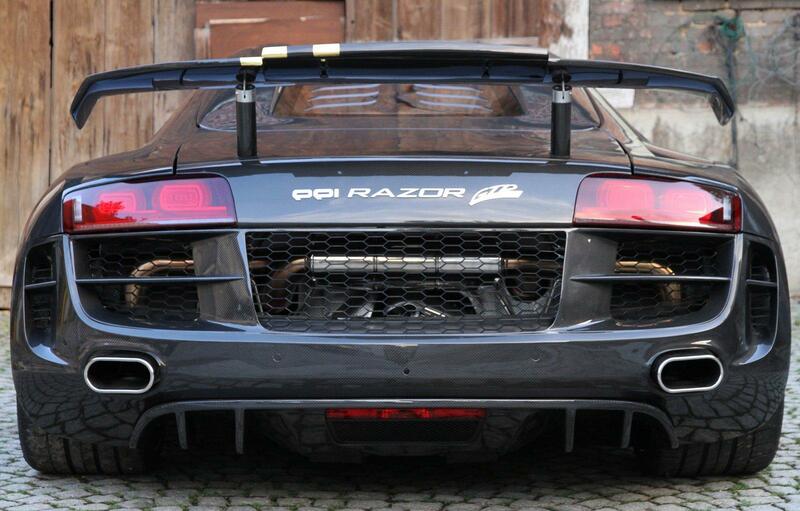 This system has been specially adjusted to the needs of the RAZOR GTR-10. And comes equipped with a Hydraulic Lift System for the front axle, which can increase ground clearance by up to 45 millimetres if needed and therefore enables the driver to enter underground car parks or drive over speed bumps. This system in combination with PPI's Springs, Camber Kit and Tie-rod kit ensure that the RAZOR GTR-10 stays sure-footed and balanced in any situation, whether on the street or race track. PPI completely redesigns the interior and turns the R8-interior into a "members-only" lounge with a motorsports flair. The serial interior is replaced by highest quality Onyx Nubuck-leather with Metallic-coloured accents and highlights per clients request. 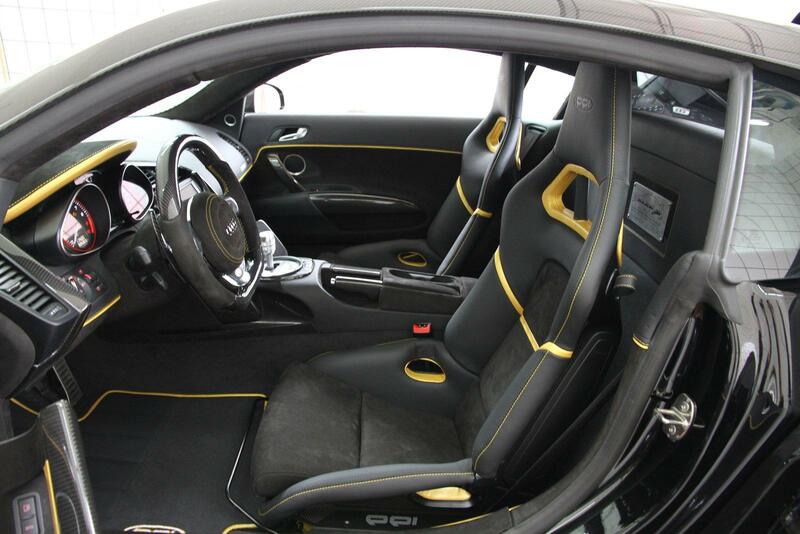 Additionally, PPI equips the limited edition RAZOR GTR-10 with extensive Carbon Fibre throughout the cockpit; hand-brake lever, door sill protectors, driver and radio console surround, door trims, center console inserts, and kneepad trims. The ultra-light folding sport seats are also made of Carbon Fibre and bear the PPI "Sport Identity" style, which is present in the headliner, the steering wheel, shift knob, door panels and center console. The technical highlight of the interior is the ergonomically re-designed PPI sport steering wheel with steering wheel-mounted Carbon Fibre Shift Paddles (R-tronic only). 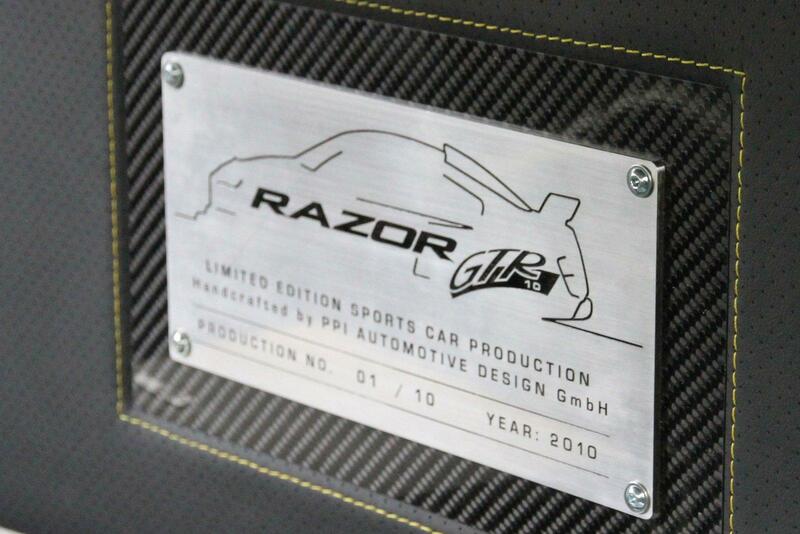 Highlighting the exclusivity of this limited series production is the RAZOR GTR-10 badging, threshold plates, and an aluminium production plaque framed by Carbon Fibre. 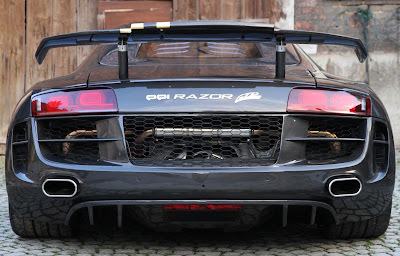 The new PPI RAZOR GTR-10 Supercar.... BOLD Design, SHARP performance, and EXCLUSIVE production, developed and presented by PPI Automotive Design GmbH, the only tuners for Audi automobiles with a true focus on "Engineering in Style."